The issue of information overload is growing in importance. People are getting more and more information via different sources – RSS being one of them. You probably use it to get feeds from blogs, news and other internet sources. Actually, RSS technology is very scalable and, in my view, can be used by PLM systems to delivery information to the right people. 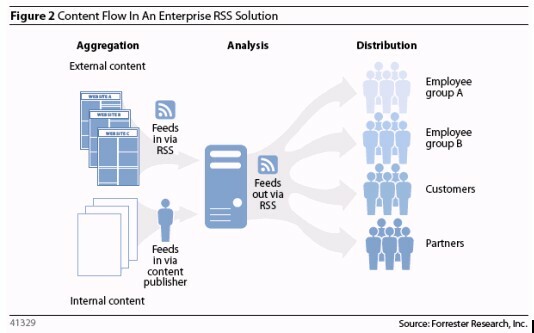 Forrester researched the space of RSS usage inside enterprises – indeed RSS can aggregate content and distribute it to PLM system users. What I like in this type of solution is that information can be delivered to internal and external (value chain) users in the same way, using an RSS feed. Conclusion: In the world of Web 2.0 and PLM 2.0, the usage of RSS feeds to distribute information can solve problems of data flow and information delivery. RSS is still not adopted by all users. What I found surprising is that there are also not that many software vendors providing an RSS solution for enterprises. An example of an existing solution is the company called NewsGator (http://www.newsgator.com/). This company- provides a solution to boost collaboration and improve social communities in your enterprise. So, the solution is relatively simple and available – you can try to use it with your PLM system. I expect that there may be some existing PLM providers who can support RSS as part of the standard collaboration functionality. I just left a comment on your current post on 3D RSS. Are you aware of any PLM systems that have RSS integrated? I haven’t seen any, but, I haven’t looked too hard yet. I have used the Google RSS reader on a Blackberry, and it worked pretty well. I could see this as a good way to track changes, or any textural information while on the go. Tom, I’ve see you comment on http://plmtwine.com/2009/02/13/can-we-create-3d-rss/. I’m using Google Reader a lot. Also on BlackBerry before and last 1.5 years on Windows Mobile. As I mentioned on my previous answer – content is biggest problem PLM have and this is keep PLM systems from going forward. – Cheers, Oleg. the top no need side effect , people could take a signal. simplest resort. If you purchase from a store, should you pay for delivery. Are you wondering how to write a PR plan that incorporates social media. practical and advanced Search Engine Marketing processes. of your competition. You’ll want to link to your video and channel from social media platforms. conversations around brands, products or companies. Instagram offers you the ability to remove a deceased member’s account by submitting proof much like Facebook and Twitter. determines what content attracts your audience and keeps them posted. top search engine forums and even local search options. are known to be exacerbated by stress; daytime fatigue and emotional distress are the most commonly reported symptoms of sleep deprivation. you do. The consumer really desires to discover you are a giver. Another excellent benefit is increased traffic to the main site. You must adopt a good, competent strategy to promote your business presence online.